By David Wright - dwright@timesgazette.com. From left, Highland County commissioners Jeff Duncan and Terry Britton, and commission clerk Mary Remsing, listen to Arc of Appalachia Executive Director Mary Stranahan speak about land acquisition in the Rocky Fork Lake gorge area. Holding its first meeting since Shane Wilkin resigned his commission post to join the state legislature, the Highland County Board of Commissioners on Wednesday passed a resolution expressing no objection to the Arc of Appalachia, a land conservation nonprofit, to apply for a grant and purchase two tracts of land in the Rocky Fork Lake gorge area. Nancy Stranahan, executive director of Arc of Appalachia, told commissioners that the organization plans to apply for a conservation grant to buy the properties, but first needs a resolution from the commissioners saying the board has no objection the Arc pursuing the grant. Stranahan said if the Arc wins the grant, it hopes to purchase about 90 acres of young forest land on the Burchett Farm property off Spargur Road, and a portion of God’s Country, a property on Babington Lane. According to Stranahan, the Arc has already purchased much of the God’s Country property. Stranahan said people renting homes on that property will be allowed to stay for two summers rent-free before being asked to leave. Stranahan said there are a number of blighted structures on the property that the Arc will clean up. Stranahan said a total of about $40,000 in delinquent taxes will be returned to the county if the organization is able to purchase both properties. Highland County Visitors Bureau Director Destiny Bryson said the Arc of Appalachia is a vital source of tourism in the area, and adds to economic development efforts in the Rocky Fork Lake area. After some discussion, commissioners Jeff Duncan and Terry Britton approved a resolution expressing the board has no opposition to the Arc applying for the grant. The commission was down to two members Wednesday due to Wilkin’s resignation. Wilkin is now state representative of Ohio’s 91st House District. 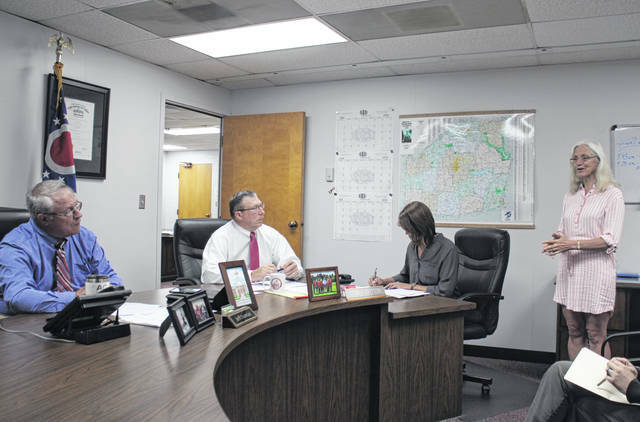 Wilkin’s replacement is expected to be appointed by the Highland County Republican Central Committee on Monday, July 2, and appear at the commissioners’ meeting on Thursday, July 5, rescheduled from Wednesday due to the Independence Day holiday. In other business, Tim Koehl, president of the visitors bureau, said Highland County should develop a plan for taking advantage of the Paint Valley area possibly being named a UNESCO World Heritage Site due to its ancient earthworks, adding that when a similar site in a different state received that designation, its tourist traffic increased by thousands of people. Koehl said diverting tourist traffic flow from Interstate 71 and U.S. Route 35 to SR 73 and U.S. Route 50 would be a start. Also Wednesday, Bryson gave the commissioners an update on the 2018 Smokin’ in the Hills barbecue competition slated for Friday, Sept. 21 and Saturday, Sept. 22 at Rocky Fork Lake State Park. Bryson said Friday night activities will be expanded from last year, with more food offerings and programming available to the public, and a children’s cookout will be held Saturday afternoon. Bryson also said Blue Steel, an area classic rock band, will perform at the event. In other business, Duncan and Britton expressed condolences for the family of firefighter Joe Patterson, who died in an accident over the weekend at the Paint Creek Joint EMS/Fire District station in Rainsboro. “Also, prayers for the other first responders, who are like family,” Duncan added. Britton said flags in Highland County will be flown at half staff Friday as Patterson is buried. Duncan said construction crews will begin replacing the county courthouse roof on Aug. 3. While work is being done, the front entrance of the courthouse will be closed, Duncan said. Duncan said the project is “a pretty major undertaking,” but the contractor hopes to complete it in one week. The commissioners also approved routine financial resolutions and contracts.